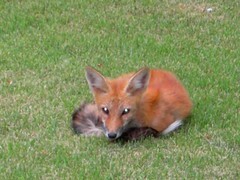 fox cub acquires fighting skills. You’ll see from video that my dog and the cub begin by having a long staring contest, followed by a confrontation that’s all bark and no bite. From watching this feisty cub close up, I’ve decided wild animals, even when they’re five-weeks’ old, are not sweet and cuddly things. Just nobody put their fingers near a cub’s mouth, or you might come away minus a few digits. I telephoned the local animal rescue people to check whether they needed to move the cub to safety, but they said leave it for 12 hours as the mother vixen is probably moving her litter one-by-one and has deposited her cub in a safe place (bad choice) and will return to collect her cub later. 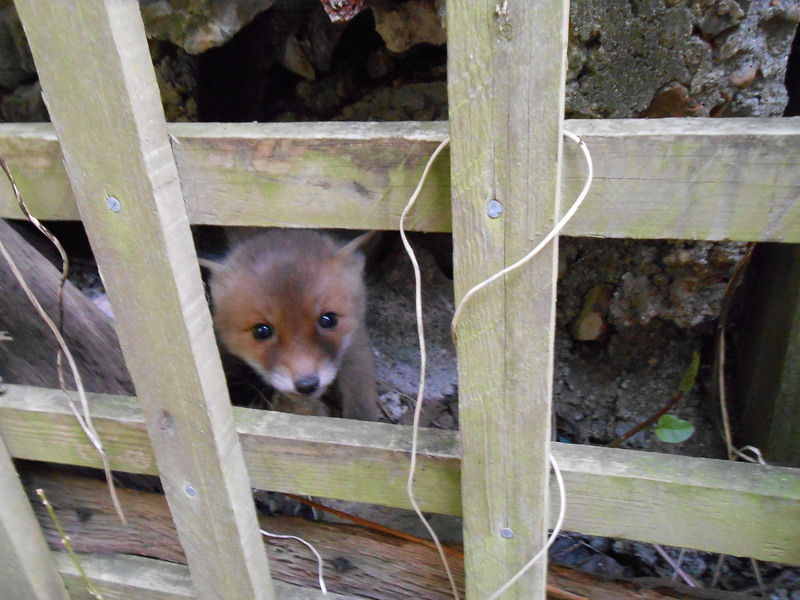 Good news, she collected her cub by midday, so I don’t have to contend with another sleepless night while my dog overturns chairs in the kitchen and bays through the kitchen window at foxes crossing her territory to move dens. Let’s hope the vixen has finished transporting her cubs now, and doesn’t decide to deposit another one behind my garden shed this evening. And just so you can all go “ah, isn’t it sweet” here is a still I took of the cub.